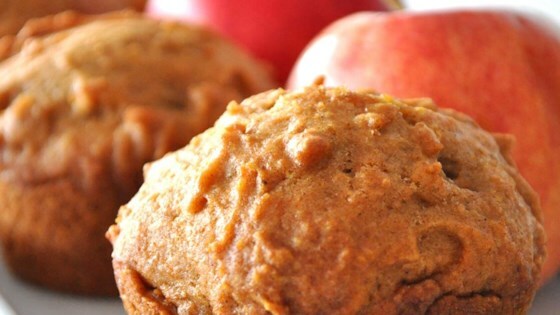 "What better way to celebrate fall than with delicious muffins that combine the wonderful texture of apples with the warm taste of pumpkin. A simple streusel topping gives them a little something extra." In a large bowl, sift together 2 1/2 cups all-purpose flour, 2 cups sugar, pumpkin pie spice, baking soda and salt. In a separate bowl, mix together eggs, pumpkin and oil. Add pumpkin mixture to flour mixture; stirring just to moisten. Fold in apples. Spoon batter into prepared muffin cups. In a small bowl, mix together 2 tablespoons flour, 1/4 cup sugar and 1/2 teaspoon cinnamon. Cut in butter until mixture resembles coarse crumbs. Sprinkle topping evenly over muffin batter. I substituted 1/2 c. melted butter for oil, sugar in the raw for white sugar and made just 12 really big muffins. I didn't do the topping. These were just okay. I loved these muffins! I added extra pumpkin and substituted applesauce for the oil, which made them low fat a delicious! I will be making them again soon. This is a fantastic muffin recipe that holds up well when 1/2 whole wheat flour and some wheat germ are used. Really nutritious and tasty. Thanks! I substituted 1/2 cup of melted butter for the oil and prepared these in 8 baby loaf pans. I gave them out as gifts and got rave reviews. A great recipe!